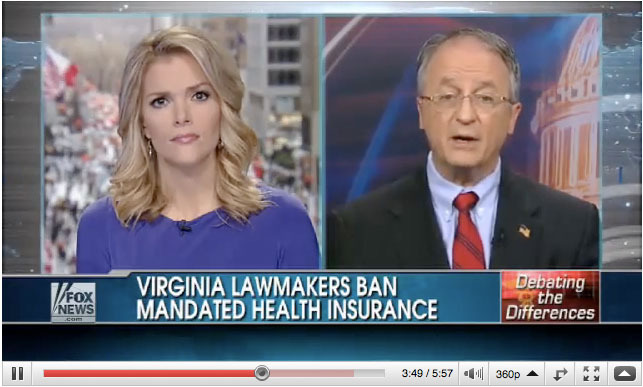 Virginia to Challenge Obamacare Health Mandates | Virginia Right! For the first time in American history individuals and businesses will be forced by the Federal Government to purchase private health insurance. Obamacare fundamentally alters our form of government and turns citizens whose rights come from our Creator, into serfs with obligations to lawless Washington predators. Despite many hours of debate on Sunday, March 21, not one Democrat Congressman could provide the constitutional authority for the unprecedented takeover of one-sixth of the U.S. economy. America’s foundational documents make it clear that the enumerated powers granted to Congress in Article I, Section 8 of the U.S. Constitution do not grant Congress the predatory powers or authority to compel citizens under threat of jail or heavy fines to forcibly enter into contracts for any good or service. Anyone who declines to buy insurance approved by the Obama Administration FOR ANY REASON, which can cost an average family of four up to $15,000 a year according to a Congressional Budget Office estimate, can be jailed up to a year and fined $25,000. The IRS will hire 18,000 additional agents to track and hunt down objectors. James Madison wrote in the Federalist Papers, which the U.S. Supreme Court cites for the original meaning of the Constitution, that state legislators have the responsibility to protect the lives, liberties and property of their citizens against Congressional usurpations. That is why the Virginia General Assembly is standing up to the rough strong arm tactics of Congressional bullies by passing my HB 10 and similar Senate measures, to defend citizens and legal residents against lawsuits from the IRS and the Obama Administration. Further, while Americans can chose a policy for themselves, that does not pay for elective abortion, every American will be forced to pay for coverage for the elective abortions of others, and conscientious objections to participating in abortion are ignored. Written on the seal of our own Thomas Jefferson is the motto, “Rebellion to tyrants is obedience to God.” Virginia has just begun to fight and will enact additional measures to protect Virginians once the specific provisions of Obamacare become known.